Welcome to the Catholic Charities of the Archdiocese of Washington’s annual Angel Tree Christmas Gift program to help families in need during the holiday season. Each year – with your support – we help hundreds of families by providing each of their children, ages 16 and younger, with a Christmas gift. Thank you for participating in any way you can! Purchase a gift for each child in a family (or several)! Click the button to see the list of children and their Christmas wishes and make your commitment. Make a monetary donation that will go towards purchasing gifts for children on the list. Please be sure to note “Christmas Gift Program” as the recipient of your gift. Sign up for a shift in December to accept gifts, to organize gifts, to help with gift pick up, or to provide treats for all the busy volunteers! 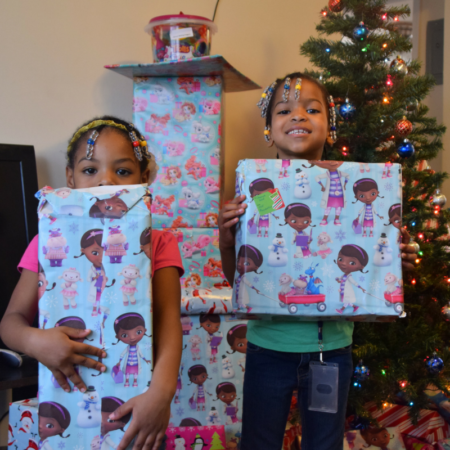 Last year, friends like you provided over 900 children with Christmas gifts! This year, donors have already committed to support families in need by “adopting” over — children! But there are still — children who need your help! Help make a family’s Christmas wishes come true!